Howdy from Texas. This is a story about Hayden, my son, who was born with congenital hyperinsulinism (HI). It may sound odd to hear how thankful we are that Hayden was born very, very sick. However, it is the severity of Hayden’s illness that we believe has protected him from the all too often, sad consequences of this disorder. Hayden was born in a rural hospital in Texas three weeks ahead of schedule weighing 9 pounds 14ounces, blue, floppy and poorly responsive. His first blood sugar was less than 20 mg/dl(1.1 mmol/l). Despite lots of IV sugar, Hayden’s blood sugar did not rise above 60 mg/dl(3.6 mmol/l). On his second day of life, he was transferred to a major pediatric hospital in Houston, about two hours from our home. He had his first seizure upon arrival, and the blood test at that time showed that his blood sugar level was undetectable. If Hayden had not been so ill, his disorder may have gone undetected (like so many others) which could have resulted in significant brain damage and disability. We were also blessed with intelligent, caring physicians who provided amazing care to Hayden; however, since Hayden’s dad and I are both doctors, it seemed like the staff in charge of Hayden’s care relied a lot on us, too. It was frightening to have never even heard of HI and to have to make such important decisions about his treatment, such as finding a surgeon to perform his pancreatectomy. I think I interviewed just about every pediatric surgeon in Houston. Through divine means, one surgeon with experience with HI (albeit slight) was available and performed Hayden’s operation when he was two weeks old. It took two surgeries over two days to remove enough pancreas to be able to wean Hayden off IV sugar. What traumatizing times we went through during those first three weeks! At one month, Hayden was able to come home with us on no medications with slightly high blood sugars. However, we were only home a few days. Because of an infection in the bone of his leg, Hayden had to be rehospitalized for another month. During the second hospitalization, Hayden’s blood sugars began dropping again. When we finally left, Hayden was on nifedipine and octreotide injections as well as frequent feedings. Nifedipine has shown to be only slightly effective (if at all) in studies, but at the time, I believed it was helping maintain sugar levels without having to go any higher on the octreotide. We hated giving the octreotide injections that made Hayden miserable with stomach cramping and white diarrhea. Within a month, we had Hayden on octreotide via an insulin pump which made a big difference in his symptoms and by about nine months old, Hayden was managed solely with octreotide and off nifedipine. At this time, using octreotide in a pump was rather novel. In fact, only a few children with HI were using this pump. So how did we hear about the pump? Well, somewhere in the first couple of weeks after Hayden was born, I found an amazing hyperinsulinism parent group that became our lifeline to information about this rare disorder. Based on information from the HyperIns group, I knew to ask Hayden’s endocrinologist about the pump. I also knew that the feeding troubles that Hayden was having were common based on other parents’ stories, so we got Hayden into oral therapy before he was three months old. Because of the “HyperIns” group, I had “friends” from all over the world who understood my worries and knew how to help. It did not matter that I was a doctor who had medical knowledge. This was my child who was sick, and these parents were more knowledgeable about life with a child with HI. When Hayden would not eat after his bout with pneumonia at 11 months, it was the HyperIns group which helped us make the decision to go ahead with a g-button. The struggles with trying to feeding every 2-3 hours were finally over (especially overnight). We were more rested from that point forward and felt more secure that Hayden would get what he needed to maintain his blood sugars. More importantly, we were able to let Hayden eat when, how and how much he wanted. To this day, Hayden has no feeding issues which is somewhat unique in the world of HI. Hayden has had at least three seizures related to hypoglycemia that we are aware of. Most of those occurred before he was 4 or 5. Somewhere around 6, Hayden began to tell us when he wasn’t feeling “right” and since then we’ve been able to intervene before any serious lows occur. Hayden no longer required the g-button after the age of 7. 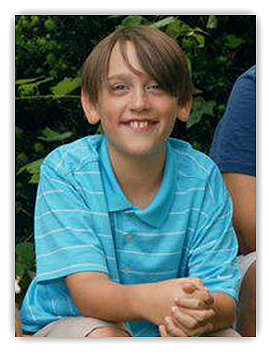 At 8, he had his ostomy site closed surgically. By 9, Hayden was off octreotide, and now at 11 he is managed solely by diet. He still has lows, but he also has high blood sugars. Through the years, we have learned that avoiding high blood sugars helps us avoid some of the lows. Although Hayden has been blessed with no identifiable disabilities from HI, life with HI is tough. One thing that really helped us (besides the HyperIns group) was reevaluating our own thinking about our son. It is so easy to compare our HI kids to non-HI kids, and think about all that they are “missing out” on. However, having taken care of adolescents who did not learn to adapt well to their chronic illnesses, we made the conscious effort to do two things. (1) Live one day at a time and not try to think too far into the future. (2) Compare Hayden to other HI kids, and not kids without HI. The second was really key. Every fingerstick, every site change for his octreotide pump or continuous glucose monitor that he had when he was older, every g-button site infection or irritation at the site, being hooked to pump overnight… we would empathize out loud with Hayden and talk with him about his treatment, how thankful we were that the treatment was available and how his life would be different without those treatments. For those who have met Hayden (now 11yo), they can attest that despite all that he’s been through, he is a well-adjusted young man who doesn’t resent what he has endured and has a good sense of humor about how HI still impacts his life.